This volume takes up the account of Comeng's history from 1977 (where the previous volume left off) and carries the story through to 1985. This period of the company's history was highly productive though unquestionably turbulent. One of the highlights in the NSW branch was the design and construction of the XPT trains for the State Rail Authority in the early 1980s. Their introduction represented a quantum leap in the development of modern long-distance passenger trains in this country. Readers can gain some idea of the political, commercial and engineering hurdles that were associated with such a complex project. At the same time, in Victoria, the huge contract for new electric multiple-unit suburban trains was an equally important milestone - in that case for the introduction of modern commuter passenger stock. From the 1960s onward the company had progressively diversified into activities that were not railway-based. These included the manufacture of engineering products and the sale under licence of a wide range of equipment used in Australia's construction, manufacturing and mining industries. 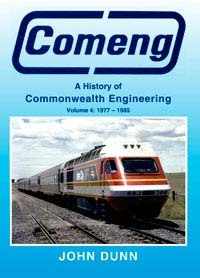 In addition to its wholly owned operations, Comeng had acquired substantial investments in Bradken Consolidated Limited, Union Carriage & Wagon Co. Pty Ltd, and Australian National Industries. Included is a short section on Comeng's involvment with Ruston Bucyrus and Bucyrus-Erie and also Fiat-Allis. Then in 1982 Comeng was suddenly taken over by Australian National Industries. This was a turning point in the company's fortunes, and set in motion events that would see the ultimate demise of this robust and well-respected group of Australian manufacturing companies. Throughout this period all the rolling stock plants were fully occupied turning out passenger trains, trams, light rail vehicles, diesel railcars, locomotives, freight stock, and a host of other smaller but nonetheless important products. Illustrated throughout with wonderful colour and black and white photographs. The final part of the story is told in Volume 5.